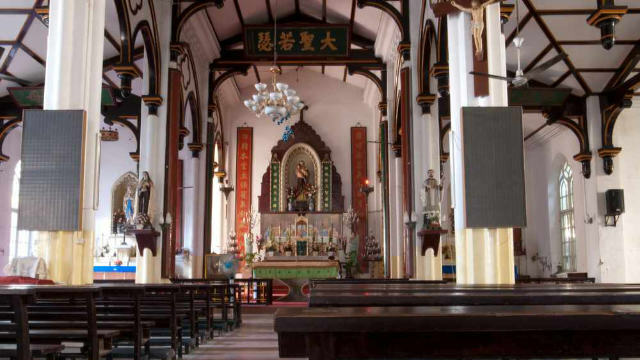 Never mind a nearly four-month-old provisional agreement with the Vatican – one that was supposed to ease decades-long tensions regarding the appointing of bishops – the Chinese Communist Party, or CCP, is upping its suppression and persecution of underground Catholic churches and believers. Under the Vatican-China deal of 2018, Pope Francis recognized the legitimacy of seven Chinese-government-appointed bishops, who, not having been selected by the Vatican, had been excommunicated. In turn, Beijing finally, and formally, recognized the pope’s authority. “China and the Vatican will continue to maintain communications and push forward the process of improving relations between the two sides,” China’s foreign ministry said in a statement at the time. And yet, the CCP is doing the opposite of improving relations with churches on the home front. The dormitory building of Taining County Catholic Church. That day, the police used a ladder to illegally enter the building to track down and arrest the priest. The following day, the police once again descended on the meeting venue, conducting illegal searches of the dormitory and harassing the believers there.